Hi ladies! I had so much trouble trying to photograph my empties this month since I changed my background so let me know what you think! I wasn't expecting to have so many empties this month since I've been on holiday (if you want a post about that, let me know! 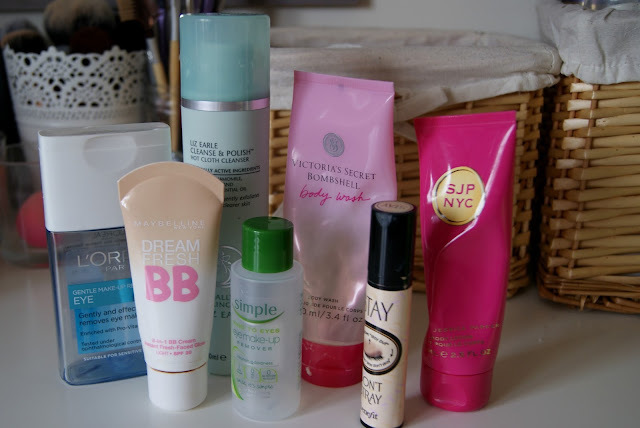 ), but I've got a fair few bits and bobs to talk about, including some of my favourite products! So lets begin. L'Oreal Gentle Eye Makeup Remover, £2.99 - I seem to go through eye makeup removers so quickly and this Loreal Gentle Eye Makeup Remover was no exception. I wasn't completely blown away with it, and I'd probably prefer the Simple one so I won't be repurchasing this one! It did take quite a few cotton pads to fully remove my eye makeup - especially the Benefit They're Real! mascara. I'm now working my way through the bi-phase version of this - the Absolute Eye Makeup Remover (review here) and I definitely prefer that one! Liz Earle Cleanse & Polish, £14.75 - My little baby - the Liz Earle C&P. This is actually the fourth bottle of it that I've finished, and I would say they last around 2 months using it every night. I absolutely love this product as it's so gentle and purifying, however, I feel like it's a bit expensive now (I've received 3 of my bottles as gifts! )and I'm intrigued to try out a different cleanser. I did find after I stopped using this that my skin worsened slightly as I think it got a bit too hooked on this! Therefore, I'm giving myself a rest from this for now and trying out the blogger favourite: Superdrug's Vitamin E hot cloth cleanser. Maybelline Dream Fresh BB Cream (no longer available) - This is actually the first base I've ever finished and I really liked this BB Cream from Maybelline. It's the only BB Cream I've ever tried (they've now replaced it with Dream Pure BB Cream). It was a lovely dewy cream that gave very light coverage - perfect for good skin days! It blended really easily with either hands or a brush and the shade was just right for me! I haven't repurchased yet as I will probably need more coverage through the winter, but this is a lovely summer base. Victoria's Secret Bombshell Shower Gel - I got this from the Bond Street store in London in a giftset and I absolutely adore this scent! I have the body mist and perfume with the same scent as it's so fresh and perfect for daytime. This was a lovely body wash, although I didn't find it did anything extra to my skin that any other body wash wouldn't do so I wouldn't jump to repurchase it. I would 100% recommend checking out the scent if you're near a VS Store though as it's gorgeous! Simple Eye Makeup Remover (travel size) - As I mentioned above, I do prefer this to the L'Oreal Eye Makeup Remover but I just used this up on holiday as I had it lying around. It's extrememly gentle and lovely for sensitive skin but I'm still yet to find the perfect eye makeup remover! Benefit 'Stay Don't Stray!' eye primer, £20.50 - This isn't technically an 'empty' but the primer inside has gone all gooey and unsuitable for use now so I'm chucking it in here too! I got this a good 14+ months ago (it says to keep it for 6 months on the bottle!) so it definitely lasts a loooong time! I did like this primer but I don't think it would be suitable for very heavy eye makeup/super long wear because I did notice creases etc even when wearing this. I definitely don't think it's worth the £20.50 price tag so if you're looking for a high end eye primer, check out Urban Decay for the best eye primers. SJP NYC Body Lotion, £11.05 - I got this body lotion around 2 years ago and only had a small amount left in it. I really like this perfume and I'm surprised to see it's only £13 in Superdrug - I may have to repurchase! It's very feminine and very Sarah Jessica Parker, so try it if you get the chance. This body lotion was really nice and light, perfect for in the mornings when you don't want a thick moisturiser. And that concludes my empties for August! I hope you enjoyed reading. simple eye makeup remover is the best eye makeup remover i've used, so good for how much it costs too! I love the Victoria's Secret beauty products. They are so good and all smell delicious!